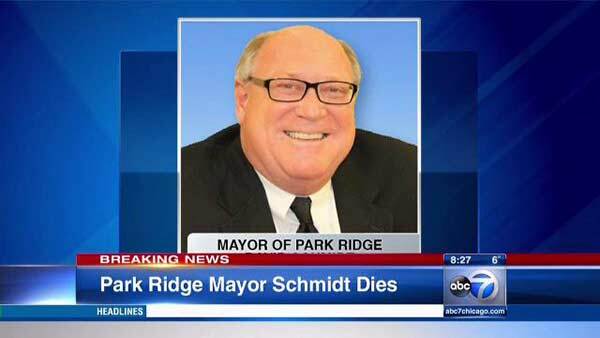 PARK RIDGE, Ill. (WLS) -- Mayor David Schmidt of northwest suburban Park Ridge died late Wednesday night. Paramedics were called to Schmidt's home just after 10 p.m. He was rushed to Advocate Lutheran General Hospital where he was pronounced dead just before midnight. The city's website says the mayor died of a "sudden illness." Schmidt was serving his second term as mayor of Park Ridge after winning re-election in 2013. He was 57 years old. Visitation for Schmidt will be held on Sunday, March 8, from 2 p.m. - 8 p.m. at Cumberland Chapels, 8300 W Lawrence in Norridge. The funeral service for will be Monday, March 9, at 11 a.m.